A heating system that distributes heat evenly to each room in the house. Warm water central heating systems use water to distribute heat thoroughly and evenly around the home. Water transfers energy at a much higher rate than air, making these systems very efficient. They can be installed in new & established homes. 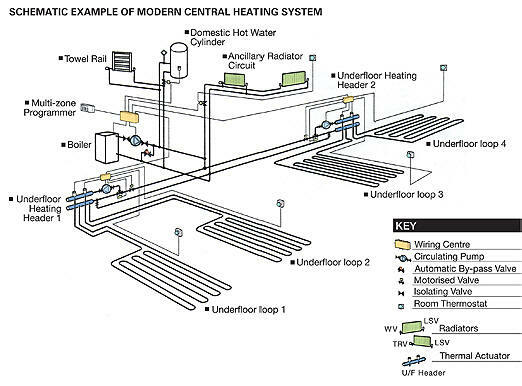 The heat source (either a boiler or heat pump, often situated in the garage, laundry or outside) is where the water is heated and the heat distribution system is either a network of looped pipes under the floor of the house, or a system of pipes under the floor or in the walls which connect to wall-mounted radiators. The heat source pumps heated water through the heat distribution system, which then releases the heat gently into the home. Combusting Boilers: Boilers that burn a fuel to transfer heat energy into water. Heat Pumps: Appliances that use a refrigeration cycle to transfer energy from one medium to another. PLEASE NOTE: All heat sources have different running costs. There are a number of ways to heat your home with central heating. The best option for your home depends upon your lifestyle, budget and the heat source that you are using. Radiators: Usually require higher temperatures that can only currently be achieved with combusting boilers. Under Floor Heating: Uses lower temperature water and can be heated by any heat source. PLEASE NOTE: Solar is generally only considered for heating a domestic hot water cylinder. Heating your house with solar is possible however it requires extensive set-up costs. The boiler pumps heated water through the underfloor pipes or into the radiators, which then release their heat gently into the home. Because there is no forced air movement, there are no draughts, hot and cold spots or noisy fans to contend with. The heat is passive and unobtrusive. It warms objects and fabric within the room. The process is superbly efficient. No water is actually consumed, and once the water is up to temperature the boiler modulates or switches off Â while heat continues to be emitted from the pipes or radiators. In New Zealand, gas and diesel-fired boilers are most common but air to water heat pumps and wood pellet boilers are becoming more popular. Most models can also produce hot water for domestic tap use. Some will even heat a spa or swimming pool as well as supplying the central heating and domestic hot water. All systems are fitted with a thermostat and time controller, allowing warmth to be delivered only when it is needed. In addition, individual radiators are fitted with thermostats, allowing precise control over the heating supplied to different parts of the house. The more sophisticated underfloor systems can also be programmed to control the duration and level of heat supplied to individual rooms or zones. A central heating system utilizing underfloor pipes to deliver heat can only be installed in a new home or renovation, before the floor slab is laid. A system utilizing wall-mounted radiators can be installed in new or existing homes.